Inline tunnel metal detector for use with conveyors. Detecting smaller metal contaminants in wet, chilled, frozen and hot foods, foods packaged in metalized film. Virtually eliminates false rejects, reducing costs and increasing productivity. Safeline Gravity Fall metal detector systems inspect bulk, free falling fine powdered and granular products in food production and non-food applications. Throat-style metal detectors that can be integrated with Vertical Form Fill and Seal processes and equipment to inspect free-falling product in-flight. Increase productivity with reduced performance testing. Increased sensitivity enables smaller metal contaminants to be detected. Technology innovations optimize testing processes and improve operator efficiency. Choose from a range of high-speed reject devices designed for specific applications. Increase productivity with recued performance testing. Increased sensitivity enables smaller metal contaminants to be detected. Highest sensitivity and reliability with small insertion space for maximum product quality and brand protection. Pipeline metal detectors are designed for inspecting pumped liquids, pastes, slurries, high viscosity fluids and vacuum-packed products in industrial food and non-food processing applications. Fully integrated pharmaceutical metal detector solutions for inspection of tablets, capsules, powders and granules. A full range of standard and bespoke-designed conveyor mounted metal detector solutions for contamination detection in food and beverage product applications. Advanced detection coil design, combined with proven Safeline software, ensures metal contaminants as small as 0.3mm in diameter can be detected and rejected. Manufactured from mirror-polished stainless steel and incorporating FDA-approved contact parts throughout, these systems provide compact, easy clean, hygienic solutions to meet industry requirements. Compact footprint enables insertion into areas where space is restricted. Robust, fully-rotating castors provide ease of mobility, enabling the system to be used in multiple locations. Available in a wide range of sizes (and combined with a METTLER TOLEDO Safeline metal detector search head) to suit all applications and conveyor systems, providing a fully automated in-line inspection. Include meat, poultry, fish, bakery, ready meals etc, through to sacked / crated produce, plus items with large product signals, such as cheese blocks and bulk meat packs. Detection of all metal types including ferrous, non-ferrous and even difficult-to-detect non-magnetic stainless steels. Our metal detection equipment can aid compliance with national and international food safety standards, as well as with retailers' own codes of practice. ASN 6000 models provide fully integrated, flexible, compact conveyorised metal detection systems for efficient checks in small/medium applications. Our range of ASN 9000 metal detectors can find contaminants in wet, dry, hot, chilled and frozen food products, ensuring high-quality end-of-line inspection. Discover more about our connectivity and data collection solutions for integrating metal detectors into production-line management information systems. A multiple-language operating system minimises training requirements and provides rapid auto set-up, product changeover and in-built performance verification routines, reducing production downtime. Advanced digital signal processing and dual-channel technology enable all metals to be detected including ferrous, non-ferrous and even the most difficult-to-detect non-magnetic stainless steels. The combination of a fully welded frame with a dirt trap-free search head supports HACCP compliance. Contact parts are made from food-quality materials, minimising the potential of product contamination. Maintenance and cleaning are made easy through the use of a 'tool-free' quick-release skid-plate, so the system can be rapidly dismantled, cleaned and re-assembled minimising production downtime. The ASN 9000 range delivers the benefits of improved operational efficiency, increased competitiveness and the lowest overall cost of ownership, for maximum profitability. A large, full-colour touch-screen menu provides easy operator access. Systems carry the capacity to display user interface screens in any one of 8 languages, including those using symbol characters. Available with a choice of modular or polyurethane belt options, the Modular belt is perfect for transporting small to medium-sized packed product, including fresh / frozen meat and seafood. Increasing process control and analysis at your Critical Control Points (CCPs) to support your performance improvements and brand protection initiatives. Productivity, Product Quality, Security and Clarity come together in ProdX, METTLER TOLEDO’s data management software. A powerful statistical quality control (SQC) software programme that covers all aspects of packaging and filling quality control for food and pharmaceutical manufacturers. Numerous methods of extracting data from the metal detector are available through our proprietary RS232 and Ethernet protocol modules through to the deployment of one of our Fieldbus Interface Modules (FIMS). Our test sample pieces support ongoing verification of equipment performance helping your business meet international food safety standards and retailer codes of practice. Test samples for all our metal detection applications are available. A wide range of sizes, metals types and hygenic carrier materials allow testing across your metal detection application. A formal certificate of conformance can be supplied with Safeline test samples. This confirms the test piece size, manufacturing standards and authenticity along with a traceable history of manufacture. All precision test spheres used in METTLER TOLEDO Safeline’s metal test samples conform to ANSI/AFBMA Std 10 or DIN 5401. Test samples are also available in test kit packs for even greater convenience. Kits can contain up to 12 test samples of varying sizes and materials. What is an industrial food metal detector? Metal detectors are used within the food processing industry to identify unwanted metal in food and safely remove any contaminated products from the production line before they leave the factory, ensuring they are safe for consumers. Industrial food metal detectors can be combined with a variety of transport mechanisms including conveyors, pipelines, gravity-fed and free-fall vertical systems and can be integrated with reject devices to provide complete detection and rejection solutions. What metal detection standards are used in the food industry? Other schemes do exist but the schemes listed above equate to over 90% of the adopted standards currently being applied. All METTLER TOLEDO Product Inspection solutions have been developed with Food Safety Modernization Act (FSMA) regulations and GFSI-approved standards in mind, and supply the documentation, monitoring and verification required to aid compliance. What types of metal detectors are used in food packaging? There are a number of metal detection solutions available to meet any food packaging challenge from tunnel metal detectors, which can be integrated with conveyors, to gravity-fed and vertical form, fill and seal metal detectors. METTLER TOLEDO Safeline offers a wide range of metal detection systems and integrated conveyors to for all food packaging requirements. Our Profile Advantage for can be used challenging applications such as wet, chilled, frozen and hot foods, and for foods packaged in metalized film, and our Throat and Super Throat metal detectors are specially designed to integrate with manufacturer's vertical form fill and seal machines and are available in a range of sizes for easy line integration. Safeline also offers integrated conveyors to meet a variety of food packaging needs including cardboard, cartons, trays and bottles. Take a look at our full range of metal detection systems. What is the correct testing procedure for a metal detector? When implementing a metal detection test procedure, manufacturers must firstly ensure their metal detector meets the required detection standards and are set up within the sensitivity guidelines. Test cards or test sticks are the most common format for test samples used to test and verify tunnel metal detector performance. Test packs should be representative of the size, shape and weight of products travelling down the line. If inspecting bulk products, precautions should be taken to ensure test samples will not be lost if they are not detected and rejected, especially if the product is being fed directly into another processing machine after the metal detection system. The selection of correct metal contaminant types is also important. Testing procedure checks include detector performance levels and complete system integrity/functionality. There are no mandatory guidelines on the frequency of tests, unless these have been identified by a retailer code of practice or by requirements from a customer or external agency. However, it is recommended that testing is carried out at the start and end of each shift and of each new product run, and should be clearly documented within standard operating procedures. What is a validation and verification procedure in metal detection? Validation is the initial qualification of a product or process against the stated design specification and belongs at the start of the metal detector lifecycle when it is first installed into the production line. A well-executed and carefully carried out installation phase is the foundation of worry-free and efficient use of the metal detector. Therefore, equipment manufacturers are in a strong position to support their customers throughout the installation/start-up process by making sure that the equipment works correctly and complies with all regulatory standards. The verification procedure ensures that metal detector remains complaint against sensitivity standards and metal detection policies. The metal detector is periodically verified (typically at 6 to 12 month intervals) to ensure compliance and demonstrate due diligence. Why buy a metal detection system? Additionally, metal detection systems can effectively improve your overall equipment efficiency (OEE) and thus reduce your total cost of ownership (TCO). Why buy a METTLER TOLEDO Safeline metal detector? 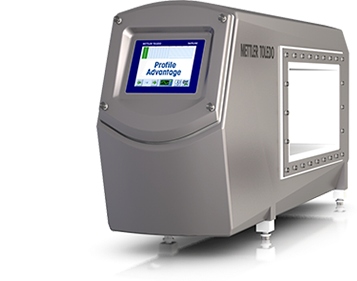 METTLER TOLEDO Safeline is the global market leader in the field of industrial metal detection systems for the pharmaceutical and food processing and packaging industries. Safeline metal detection solutions offer maximum detection sensitivity with minimum false rejects. Safeline metal detectors for food processing can inspect products in all formats, from packaged conveyorized food products and bulk powder or granular materials through to liquids, pastes and slurries. Metal detection systems can be utilized to provide compliance with food safety inspection standards, industry guidance and legislation. Safeline pharmaceutical metal detectors provide self-contained inspection systems for use with all tablets, capsules and pharmaceutical powders. These systems ensure compliance with regulatory requirements, validation and qualification of procedures.